Thomas Bryant is an American professional basketball player who plays in the National Basketball Association (NBA). As of 2019, Thomas Bryant currently plays for the Washington Wizards as their Center. Thomas Bryant has also played for other teams in past. As a Center, Thomas Bryant reportedly earns around $1,378,242 as his yearly salary from Washington Wizards. Further, Bryant has an estimated net worth of over $1 million. Scroll to know more about detail about his career. As of 2019, Thomas Bryant has an estimated net worth of over $1 million. He reportedly signed with Washington Wizards in 2018 and has an average salary of $1,378,242 annually. Bryant is the 14th best-paid player of this year while players like Otto Porter, Bradley Beal, John Wall is top best-paid players of Washington Wizards. Bryant so far has made earnings of $2,193,857 from his entire NBA career. Kept aside Bryant financial earnings, his personal assets include a home and a car. Further, the NBA Player also earns a good amount of money from various sponsorships. Thomas Jermaine Bryant is an American born basketball player. As seen the data regarding his family on media, he might not have any siblings. There is not any specific information regarding Thomas Bryant's wife yet he is still unmarried. According to some source, he has been seen with a girl named Hanna Langenderfer. Bryant might be suspiciously romantically involved in a relationship with Hannah. however, we can't be sure about his bond as the details are still not disclosed. Thomas Jermaine Bryant was born on July 31, 1997, in Rochester, New York to father Edward Bryant and mother Linda Bryant. As per his nationality, he is American and belongs to an African-American ethnic group. Further, his star sign is Leo. Bryant attended Bishop Kearney High School in Irondequoit, New York where he played for his high school basketball team. After completing high school, Bryant enrolled at Indiana University and joined the Indiana Hoosiers men's basketball team. On June 22, 2017, Bryant was selected by Utah Jazz with the 42nd overall pick in the 2017 NBA draft. Subsequently, he was traded along with Josh hart to the Los Angeles Lakers in exchange of Tony Bradley. During the 2017-2018 season, Bryant was assigned by Lakers G League Affiliate club, the South Bay Lakers. 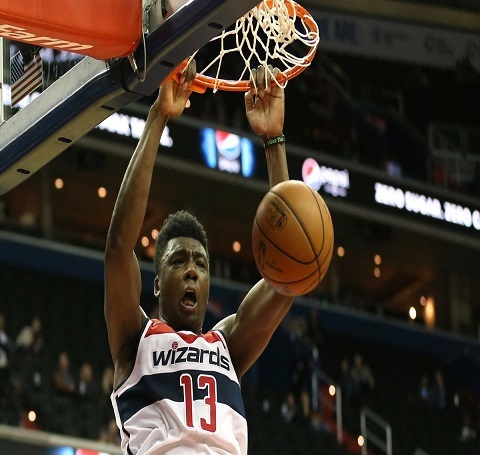 On July 2, 2018, Washington Wizards acquired Thomas Bryant to their team. Other than being a famous NBA basketball player, he has also gained equal fame in social media with numerous follower of 69.3k on Instagram and 31.8k on his official Twitter account. Thomas Bryant is not only a world-class athlete but also has a very attractive individual. The Famous NBA star measures 6 ft 11 in / 2.11 m in height and weighs around 248 lbs / 112 kg.